As you may have heard, the University of Utrecht has taken the extraordinary decision to completely shut down its Astronomical Institute SIU by 2014. You can read about in a blog post written last week by Sarah Kendrew, and there is also a press statement issued by the SIU. This is the scariest astro-disaster since the INAF panic. Utrecht is a significant fraction of Dutch astronomy; it is one out of five universities in the NOVA alliance , although of course a significant fraction of Dutch astronomy also goes on at two big NWO labs, ASTRON and SRON , as well as the ESA establishment ESTEC. The University of Utrecht is facing a horrible problem of course – 20% cuts. Like much of the rest of Europe, the Dutch – yes, even those softy liberal dope smoking Dutch – have decided that the age of austerity is upon us, and that the only way to get back the money we gave to the banks is to cut it from public services – from the armed services, from arts and culture, from everything. There have been some protests, eg over university cuts and arts cuts, but there is also a feeling that there is a puzzling absence of coherent mass protest against such drastic wholesale cuts , as explored in this RNW video piece. The dutch deficit is pretty similar to ours – an accumulated debt thats about 75% of GDP, and a running annual deficit of 10% of GDP. You can see the UK statistics on an official government website, or loook at an interesting private analysis here put together by conservative writer Christopher Chantrill . To put this in perspective, France has reached about 100% of GDP, Italy 130%, and Greece 166%. So are we in a historically unprecedented debt-saddled epoch ? Nope. As the figure below, taken from Christopher Chantrill’s site, shows, debt as a fraction of GDP has been larger than 75% in the UK for the majority of the last few hundred years. So where does the moral panic come from ? And why is it currently so obvious to everybody in Europe that what we require is to cut spending, as opposed to (a) increasing taxes or (b) growing GDP by investing in economic activity ? Well… I am not a knee-jerk Keynesian. These issues are practical, not philosophical. But it is puzzling that every government in Europe suddenly believes in austerity. As scientists we should care, both because we should believe in evidenec-based policy rather than ideological strife, and because science is the epitome of the case for investment for growth – over fifty years, not fifty weeks. This entry was posted on Monday, June 27th, 2011 at 9:15 am and is filed under Astronomy, Life, Science and Technology. You can follow any responses to this entry through the RSS 2.0 feed. You can leave a response, or trackback from your own site. Why are these pingbacks so long? And why two of them? There are strong rumours that INAF is under threat again too – at least reorganisation if not something worse seems to be threatened. Mike – if you have any details, or a link, do let us know. Andy: shame on you for promulgating the loathsome “upcoming”. What do you have against “forthcoming”? I expect better linguistic standards from your blog, going forward. Andy was surely being kind to the colonials; I don’t think I’ve heard the word “forthcoming” for decades. It’s a bit like “whilst” over here. 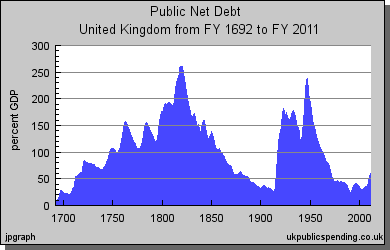 I’m not sure the Public Net Debt graph provides any useful information. The pre-20th century economy was dominated by the Empire, so its difficult to separate out just the UK economy, and the mid 20th century debt is obviously dominated by the Wars. If you look at the brief post-empire, no world war, timespans the debt has normally been below 50%. > the debt has normally been below 50%. So do we infer WWIII is about to arrive?